Pitch Day on May 16, 2014 – Sponsor Needed! Class “Triumphant’ 21 will host Pitch Day on Friday, May 16, 2014 from 11:30 a.m. to 5:00 p.m. and we need your help to make it a success! On Pitch Day, over 80 aspiring entrepreneurs will deliver their business plan presentations in a “Shark Tank”-style event. This event serves as a sort of dress rehearsal for the final Business Plan Competition that we will host this June 5 and 6. Pitches are 7-10 minutes each and present a fully refined concept. Your feedback will help our participants to put the finishing touches on their plans and their pitches before the final BPC event. Get ready to be impressed, ask tough questions and provide good feedback! To learn more and to register, click here. We Need an Event Sponsor! Sponsors make this event possible. For as little as $500, you and/or your company can transform the futures of our participants. Sponsors are provided with meaningful recognition opportunities, which are detailed here. Plus … the sponsor ensures that we can provide coffee and cookies to everyone at the event. Where else can you make hundreds of people THAT happy for as little as $500?!?! Our photos from Class 20’s Pitch Day are now posted on Zenfolio! See them all here. Thank you to the many executive volunteers who made this our largest Pitch Day event yet! The only thing better than having our friends join us in prison is when they bring their own friends to meet PEP. This Friday, Class “Noble Nineteen” will have one of the largest audiences in PEP’s history to join them for their Pitch Day … more than 80 executives have registered to attend the event, and we are officially sold out! It’s going to be an incredible day. If you are not able to join us, please consider registering to attend our Class 19 Graduation on Friday, June 7 from 2:00 – 5:00 p.m. More details here. 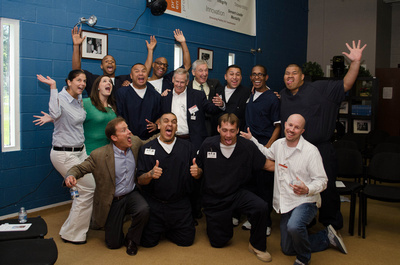 Last Friday, a crowd of executives, entrepreneurs and investors joined the Prison Entrepreneurship Program at the Cleveland Correctional Facility for our Class 17 Pitch Day. The event went exceptionally well . . . but don’t take our word for it! Thank you for an awesome “Pitch day” this past Friday. When I first attended PEP with Iris, I must admit I was skeptic. All it took was that first visit to prison, and I am convinced that PEP is an amazing program! Here it is, Monday and I’m ready for a hectic, yet hopefully productive work and school week! Yep, I’m dragging, so I take a deep breath and say, “I can do this”. I’m coming off of the emotional high from “Pitch Day” this last Friday, and low and behold, I get another package from PEP?!? Reading the thank you notes puts me on that high all over again! Now I KNOW this week will be AWESOME! I can’t help but thank God for the life changing blessing I have gained from being a “repeat attender” to PEP! The thank you cards are not only in the most beautiful penmanship I have ever seen, but the heart filled words of thanks overflow my heart with emotion and gratitude! I don’t think the participants know that I should be thanking them for the impact they make in my life. Each time I’ve received a package of thank you notes, they came at just the perfect time, one would think I am the one in prison! Every time I visit, I am renewed by the changes and growth that I see in the participants. A sense of new beginnings, hope and courage is restored, by seeing God’s love at work (and in prison no less!). It’s amazing to see the transformation that can take place when we open our hearts and are willing to be vulnerable and overcome our fears…this is what keeps me coming back. Nevertheless, I want to thank you for dedicating your lives to PEP! I’m looking forward to seeing you at graduation! Thank you, Adelee! We appreciate you and everyone else from Insperity. Join us for “Pitch Day” next Friday, May 18! Our participants will deliver their business plan presentations in a “Shark Tank” style format, in front of a live panel of executive judges (i.e. YOU!). This will be their last formal presentation before the Business Plan Competition on June 7-8. Your role is to listen, ask tough questions and provide good feedback so that they can deliver the strongest presentation during the BPC in June. Our participants have been refining these pitches every day since our January kick-off for Class 17. By the time graduation is here, they will present these plans over 120 times in front of other people… so get ready to be impressed!